Catherine Ferry was born on July 1, 1953. 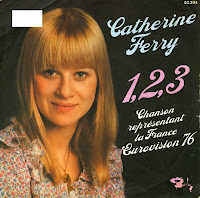 She represented France at the 1976 Eurovision Song Contest with '1, 2, 3' and finished second, behind Brotherhood of Man with 'Save your kisses for me'. The song received a total of 147 points, which is still the highest number France has ever achieved in the contest.